It’s been a strange year in my backyard. A few months ago I told you about the peanut-eating robin. That was just weird. Also notable, in a different kind of way, was the general absence of house wrens. Our wooden nest box went unused for the first time in years. I missed having tenants. House wrens always pay their rent, rewarding landlords with their incessant, bubbly song. For a small bird, they are amazingly loud, too. If wrens are in the neighborhood you know it, and spring just isn’t the same without them. On the bright side, it’s been a surprisingly good year for Carolina wrens in my yard. Larger than a house wren, the Carolina is far less common in our region. 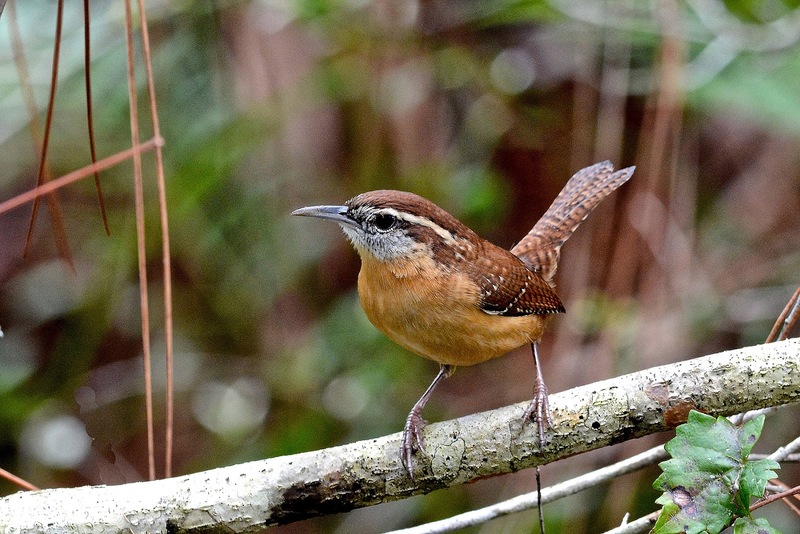 I’ve seen and heard Carolina wren many times while vacationing in South Carolina, where it’s the state bird. I think of it as a “southern species.” This notion is reinforced every April when I watch The Masters golf tournament. Singing Carolina wrens and tufted titmice can always be heard during the telecasts, as if the tournament organizers fitted them with miniature microphones. Fortunately for us, the Carolina wren has expanded well beyond Dixie. Today, Chicagoland is considered the northern edge of its breeding range. And unlike the house wren, the Carolina is non-migratory, meaning it can be found here in all seasons. Carolina is also the only wren that may break into song in the middle of a snowstorm. The species sings year around. The bird’s emphatic “teakettle, teakettle, teakettle” is the familiar vocalization but I heard some variations of it during the summer. My new rule of thumb is that when I hear a high-volume bird song not immediately recognized it is probably a Carolina wren. My first Carolina sighting this year was in February when a single bird visited the peanut feeder. From May through September I heard the wren often and even witnessed two birds at once. I strongly suspect that a pair nested in the neighborhood. I’ve had years without a single sighting of Carolina wren, so 2014 has been a treat. But another wren species, the winter wren, is even more uncommon in the backyard. Spotting one takes some careful observation and some luck. Your best chances are in April and October, when winter wrens are migrating to and from their breeding grounds in the North Woods and Canada. Yes, now would be a good time to watch for a tiny, mouse-like bird scuttling around in the garden and under your shrubs. Winter wrens are most often on the ground, foraging for small insects and spiders. They are smaller, rounder and darker than house wrens, with a stubby tail that points up. Picture a wind-up toy with feathers. I was fortunate to host a winter wren on consecutive days in mid-April. The bird never revealed itself for long but I did manage a few passable photos when it popped into the open on my back patio. I was in the kitchen, sprawled on the floor, shooting through the sliding glass door. It was a rare opportunity to be close and nearly eye-level with our most diminutive songbird. Some say the winter wren has the sweetest (and longest) song of all the wrens. I can’t argue that, based on recordings I’ve heard, but hearing one in real life is still on my birding bucket list. Five kinds of wrens are possible in DuPage, so I’m compelled to also mention marsh wren and sedge wren. As their names suggest, these two species are closely associated with specific habitats. Neither one is likely to visit a typical suburban backyard. To find them, I suggest a trip to Springbrook Prairie in Naperville early next summer, or any other forest preserve with wetlands and open fields. For more information about wrens, and to hear their remarkable songs, try Cornell University’s excellent online resource, All About Birds dot org.